Twitter boasts having 320 million active users, and while it’s a little more reluctant to divulge the number of inactive accounts, they number in the millions as well. Chances are your ideal name may already be taken. It’s frustrating when someone else has registered your name or business name, especially if you find out they’re not even using it. Twitter does have a policy in place for trademark infringements, but if your name or business name isn’t a registered trademark you’re probably out of luck. Even celebrities have had to resort to workarounds like @TaylorSwift13 or Jennifer Love Hewitt’s @TheReal_Jlh. Below are a few other tricks you can use instead. Before we get into specific methods for coming up with a new Twitter name when yours is taken, it’s important to go over some best practices for social media usernames in general. Your social media usernames are reflective of your brand, whether that’s your personal brand, blog brand, or a business brand. Your usernames make an impression, whether good or bad. It’s a good idea to check whether your desired business or blog name is available as a domain registration and username on social media platforms. You can do this quickly with a tool like NameChk. Your domain may be longer that is allowed for social media usernames, but you can always use a shortened version. But using different usernames across social media platforms is just asking for trouble. If your Facebook page is found under facebook.com/janesmith, then your audience will look for you on Twitter, Instagram, and Pinterest using the same username. If you chose another username because “janesmith” was already taken by your competitor, guess who you’re now sending your audience to? If your name is already taken on one platform, you should seriously consider changing it across all platforms in order to be consistent. If you’re unable to use your actual brand or personal name on social media, be sure that the name you do choose is memorable. It should be closely related to your brand name, and easy for your audience to recall. As soon as you start thinking about a name for your business or blog, and you find that the name is available… take it! Right now! Don’t stop and think about it, just reserve it. You can always delete the account later on if you don’t use it. If you’ve already come up with the ideal username, but there’s an inactive user squatting on your name, there is one thing you can try before giving up on it. Twitter literally has millions of inactive users, so be sure to check their inactive account policy before giving up. While their official policy does state that they can only help out those with registered trademarks, it may not hurt to ask. A twitter name can be 15 characters long, so if your brand name is longer than that you can experiment with different ways of shortening it. For example, for my blog Amazing Women In History, I chose the twitter name @womeninhistory. For a personal name, try shortening your first name or adding a nickname (e.g. Chris instead of Christine or Christopher). I’m lucky in having a unique name. I’m pretty sure I’m the only KeriLynn Engel, ever! But you might have found that you have name doppelgangers around the world who have already monopolized your name on social media. If that’s the case, you can use keywords to set yourself apart. This is also a great way to broadcast what you do and what sets you apart from your namesake. Blogging Wizard contributor Elna Cain does with her username, @ecainwrites. If your name’s already short enough, try adding an initial like @SarahKSilverman, or using a first initial like writer @SHurleyHall. This is a great idea for local businesses, or businesses with multiple locations. You can add your country (@HistEdSocUK = History of Education Society UK), your state (@ProChoiceWA = NARAL Pro-Choice Washington), or your county or city, if you can fit it! This tip is last because it’s not ideal. Underscores not only take up your valuable 15-character limit, but they’re also hard to remember. If your desired username @examplename is taken, it may not be a good idea to use @example_name instead. You take the risk of your followers (or potential followers) accidentally linking to @examplename instead. Whichever twitter name you use, make sure it’s meaningful, memorable, and unique! 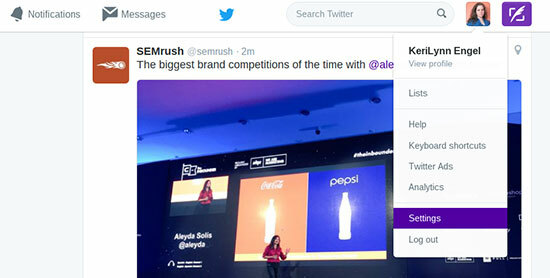 Maybe in reading this, you’ve realized you’d like to change your Twitter username to be more consistent across social media platforms, or to create a more memorable brand by getting rid of an underscore or other nonstandard spellings. 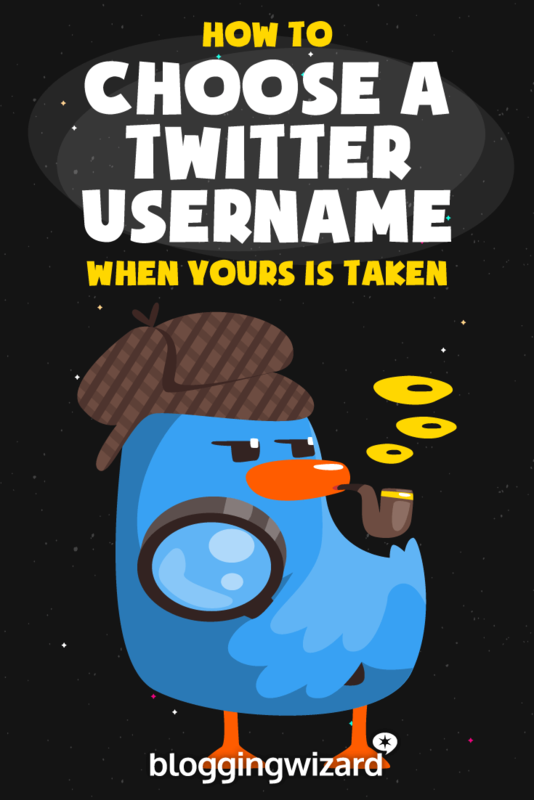 Or maybe your desired username has finally become available! Whatever the reason, there’s no need to create a whole new account and lose all your followers and account history. Changing your Twitter username is pretty simple – here’s how. Click on your profile picture in the top right corner, and click on settings. Your username will be updated, but you’ll be able to keep all your followers and old tweets. Notify your followers of your new username so they’ll know when trying to @ mention you. Consider pinning your new username notification tweet for a while, so everyone who looks at your account will see it at the top. Update your social media links on your website, other social media profiles, author bios, email newsletter, and anywhere else it’s mentioned!